A fascinating encyclopedia of super human powers and abilities which most people can learn. Includes stories of persons who had these abilities and exercises to learn them. 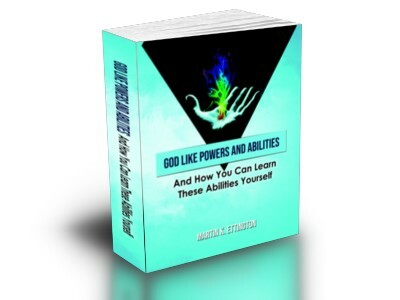 What are God Like Powers & Abilities? These are the abilities of the human spirit which are supposed to be impossible, but which really exist. The abilities and powers reviewed in this book include Telepathy, Psychokinesis, Levitation, Invisibility, Invulnerability, Teleportation, Creating your future, Prophecy, Omniscience, and much more. Why a book on this subject? I’ve read about these abilities over the years in many different books and articles (as well as my own experiences) and thought that others might want to learn about them in one organized encyclopedia of the subject. Why is this book worthwhile? This book will help the reader understand what is the basis for these powers before going into a full review of each one. Like most of my books, I take the reader through some background material before I get into the meat of the subject. In this case we start by reviewing the original source of God Like abilities “The Yoga Sutras of Patanjali”, and how these abilities and powers work. After that we proceed into a discussion of the vital forces or “prana”, the energy body and what that energy is used for. What will I learn about these Powers and Abilities? In each of the chapters on individual powers and abilities I start by explaining what the ability is and how it has been used in the past. Then some historical and/or modern documented experiences of the ability or power is given. Finally, I provide exercises and practices to learn these abilities for yourself. I’m not going to claim that anyone can learn these abilities and powers right away, but a clear path is provided on how to get there. Reference materials to other books and sources which can help you learn more are also provided. This includes links in the electronic versions of the book and a detailed bibliography or sources. Many saints and Yogic adepts have been said to be able to levitate throughout history. Saint Joseph of Cupertino (1) (Italian: San Giuseppe da Copertino), (June 17, 1603 – September 18, 1663) is an Italian saint. He was said to have been remarkably unclever, but prone to miraculous levitation and ecstatic visions that left him gaping. In turn, he is recognized as the patron saint of air travelers, aviators, astronauts, people with a mental handicap, test takers, and weak students. He was canonized in the year 1767. A 37-year-old man goes into a bathroom and comes out, apparently, totally invisible. He attempts to engage in conversation with several people, including his own girlfriend, but is ignored completely. He asks her for a cigarette, but receives no response. At first he thinks they are playing a joke on him and so returns to the bathroom in anger. When he comes out again, it's as if nothing had happened. Everything is back to normal and he could be seen again.